Moving on, let’s talk a little bit about the Fate of the World, and the Heart of Azeroth. When we last left of, Magni and M.O.T.H.E.R. were determining how best to start healing the planet. Unfortunately, since then, things have gotten worst. Giant wounds are opening up all over the world, and we don’t have a good way to heal them. In addition, they have detected that Titanic Essences are beginning to leak out of Azeroth. Now the Titans imbue their powers into all kinds of different things: into automatons like Mimiron and the titan keepers, into the planet itself, and certain structures, into the dragonflights, and we are finding that all of these essences of the titans are no longer clinging to Azeroth the way they once did, as the planet is dying. So these titanic essences are starting to coallesce all over the planet; and they are very powerful. So what Magni and M.O.T.H.E.R. are going to do, alongside us: the champions of Azeroth, is rebuild the Chamber of Heart. Here we see the rebuilt Chamber of Heart itself, and we will also gain the ability to build a brand-new structure in here called the Heart Forge. Here next to me you can see the Heart of Azeroth socketed into the Heart Forge. 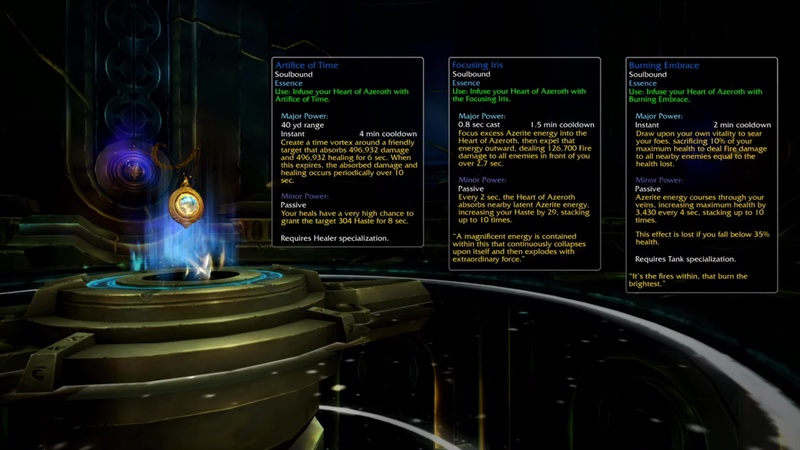 Doing so, unlocks the ability for the Heart of Azeroth to absorb these Titanic Essences and gain great amounts of power. In doing so, we are going to finally start sealing some of these wounds, and making some progress in terms of healing Azeroth. But what does this mean for gameplay? What does this really mean to socket and slot an essence inside your Heart of Azeroth? Let’s take a look. 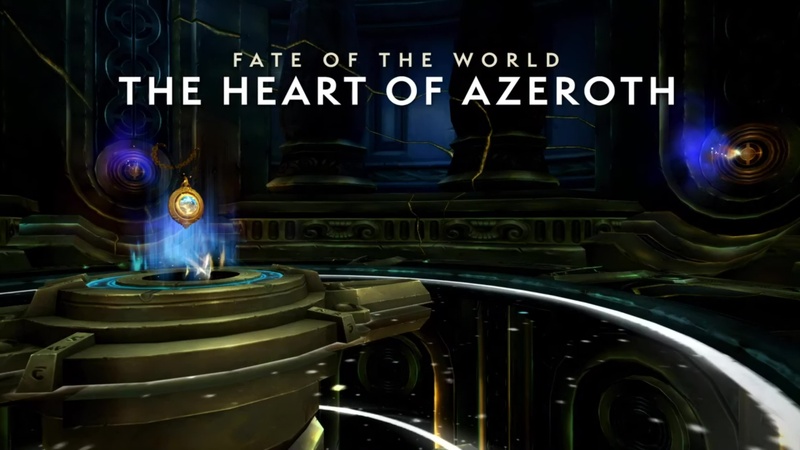 When you first unlock the Heart Forge, you will gain the ability to slot essences into this constellation-like structure in the Heart of Azeroth. 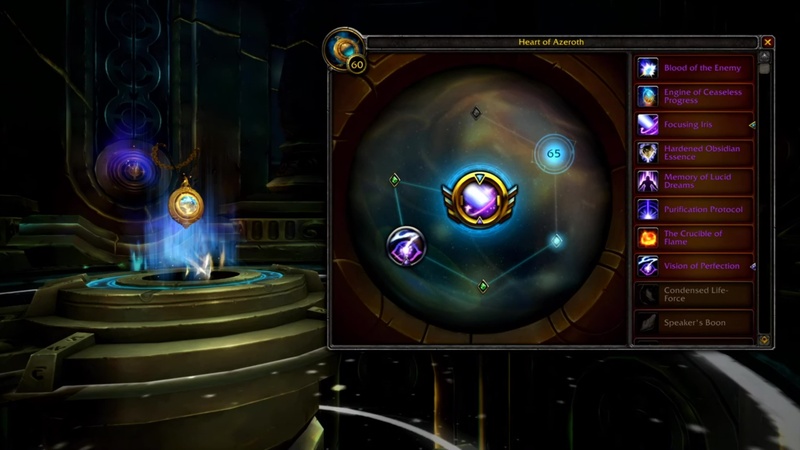 The first slot you will unlock is the big golden one in the center; and as you continue to level up the Heart of Azeroth, you unlock all of the remaining nodes in the constellation. Unlocking a large slot in the center, allows you to slot an essence shown here on the right side into it. This grants you a brand-new artifact level active ability. This is a powerful new ability that your character gains depending on what essence you have slotted there. As you continue gaining power, you will gain two additional slots, that are minor slots. These are shown in the lower-left and upper-right hand corners of the constellation. Slotting an essence into a minor slot gives you a passive bonus. The slot in the center: the major slot, is the slot that gives you the big active bonus. Essences, themselves, have multiple different types. We want you to feel that you have a variety of different active abilities that any of your characters can choose from as you collect all of these essences. This gives you a huge amount of customization. Any one of these essences, slotted into a major slot, will grant you both the major power (shown at the top), and the minor power (shown at the bottom). Any of these essences slotted into either of the two minor slots will give you a minor passive power. These way, you can change your characters active and passive powers depending on what you happen to be doing for the day, what boss you are fighting, or what other situation you are running into. We want all of this to feel like awesome abilities for every character. Essences also come in a variety of different ranks. You can obtain a higher rank of an essence without having the lower rank of the essence. It is not the essence itself ranking up, but they come with the ability to collect a number of different ranks of them. As you get a higher rank of an essence, that essence may not necessarily get simply a damage boost; but you may see other utility elements, the addition of charges, and a variety of other things. The complexity of your decision making about which essence to use when is going to increase as you collect more and get higher ranks of them. Now for those of you players who get really really into the system, really like Mythic raiding, top-end PvP-ing, there is the top level of essence shown here on the right: in the legendary orange. If you are able to obtain the top level of an essence, you gain a dramatic cosmetic appearance change. When you fire off that ability, everybody will know that you have been able to obtain the legendary rank of that essence. 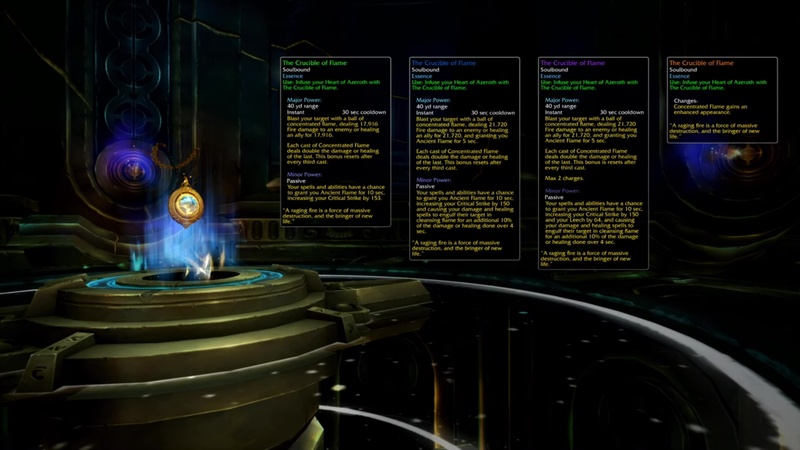 Now collecting all legendary ranks of all the essences isn’t going to be pretty difficult, as essences come from a variety of different things in World of Warcraft. You can get them from questing, from raiding, you can get them from doing outdoor activities, and getting reputation, you can get them from dungeoning, and from PvP-ing. If you want to collect everything in the Essence System, you are going to have to do a lot of different activities; and maybe, you are finding that doing one particular activity helps you work toward one essence, getting you a lot of agency on how you want to progress your character on any given day. We think the Essence System is very exciting. It gives you a huge amount of customization for any character, and a lot of things to go out and collect. Similar to Artifacts. We are really looking forward to your feedback on the system; and we know this is a lot to take in, and a lot of tooltips right now. So we have actually a blog post coming out at the end of this presentation that will explain much more of this in detail.